Shnoop.com was founded in August 2006, is located in Brooklyn, NY and is operated by the same people that operate BlingDaily (which sells jewelry and watches) and Pennywise (which sells gadgets). 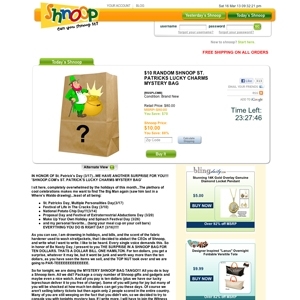 Like BlingDaily and Pennywise, Shnoop offers only one deal per day, but unlike the others, Shnoop doesn't focus on selling items in a specific category and instead sells general merchandise. Shnoop.com currently ranks #113 amongst sites offering online deals -- BJJHQ ranks #112. In the General Merchandise category, Shnoop.com ranks at #37 -- MidnightBox ranks #36. Amongst all deal a day sites, Shnoop.com ranks #19 -- BJJHQ ranks #18.